Ever since Vaneeesa invited me over to write a guest post for iRez, I’ve been thinking about what gaming means to me and how to start this damn article. Fact is, I’m a strong believer in online identities, and I believe everyone is expressing themselves in some way or another, even when just playing an MMO. Naive? Feel free to call me that, but read my articles first! I write a blog, Ravalation, in which you can read my day-to-day thoughts about the three games I play: Lord of the Rings Online, Star Wars: The Old Republic and Mass Effect. * Today I take a step back and try to see who I actually am as a gamer. What identities do I adopt when playing these games? And why? Mass Effect – An “ego-shooter” in which you need to save the galaxy from evil machines. How does that possibly involve creating your own identity? Star Wars: The Old Republic – An online game based on the world of Star Wars in which you can play for either the Republic (“good”) or Imperial (“evil”) side. Lord of the Rings Online – An online game based on the world of Tolkien in which you help the Free Peoples behind the scenes in the events forming the War of the One Ring. I don’t feel the need to be the character when gaming or reading. I’m not creating a separate identity for myself. The draw for me has always been the world itself. I challenge her. Even though Eva doesn’t go as far as to create separate ‘in-game’ identities for her characters, I suspect she does have a gamer identity that might be expressed through her characters. Most people do feel attached to their characters in some way or another, otherwise we could all just as well play stick figures. Why do we all spend so much time to get just that outfit or pet? The answer is simple: we want to show ourselves – to others and to ourselves. Game developers are aware of this. Check out how you can “add identity” to your character! Some of these are real no-brainers (like “name”), but hey, what does this tell us about ourselves? In medieval times, monks wouldn’t sign their books as they believed it was God who held their pen in the first place. These days we stick our name to everything. Back to my own experiences. 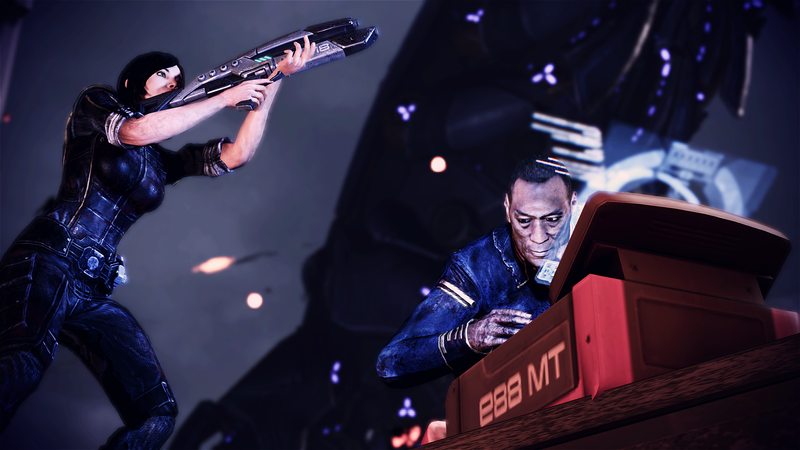 Next time I’ll write about a specific gaming identity, and I’ll start off with Mass Effect. Stay tuned! * A recent addition is Skyrim, but I’ll skip that one for this series. Ravanel explores the virtual world of Star Wars: The Old Republic at ravalation.blogspot.com. Whooo, I can’t believe it’s actually useful. Glad to hear! I know very little about how these game platforms work, and even less about how one creates an identity within them, so your post is illuminating from a comparative perspective, thank you. My world of choice is SL, and I’ve often thought about aspects of developing one’s identity within it. I’m no stranger to this IRL, because I realised from an early age that how one projects oneself can greatly influence other people’s perception of you, how you are treated, and what results you get. As you probably know, SL offers the option to do all of these things (name, appearance, one’s personal background, in-game decisions and how they influence the unfolding “story”, and interactions between ‘players’), with virtually no limitations. Yet, many SL residents choose to do what I suspect Eva does, and essentially ‘play themselves’. Why? I think the reasons for choosing this approach are many, but it may have to do with how people go about serving their needs. Two opposing needs that people have are the need for certainty and the seemingly contradictory need for uncertainty. People seeking certaintly, would most likely enjoy keeping the variables more constant (including their identities, where they go, who they interact with, and how they spend their time) to feel the comfort arising from an experience they can more or less control, while people seeking uncertainty and variety may change everything about themselves to feel the excitement of something completely new and unexpected. And, of course, there are hybrids, like me I suppose, who enjoys a mix of both certaintly and uncertainty, just to see what happens. I could be wrong, but I would guess that one’s level of certainty or uncertainty wouldn’t correlate much with ones degree of attachment to one’s avatar, as either an augmentation of themselves or as an opposite foil. In the end, perhaps it is the experiences we crave, whether they be certain or uncertain, which lends to our attachment to our avatars, and consequently our virtual identities? That’s interesting Becky, when you say “need for certainty – need for uncertainty” it does sound a little bit paradoxical, but words that might seem less paradoxical might be Pattern and Variation. Most of us wouldn’t like a life of 100% pattern… nor one of 100% variation… hearing someone play “chopsticks” on the piano for hours might drive you crazy… just as the total random banging of piano keys for hours might be fatiguing. Yet a piece of music that rewards our attention with the predictability of a pattern, then surprises us with an inspired variation, that can be a pretty engaging piece of music. If there was a dial that went from 100% Pattern to 100% Variation, I suppose we’d each set our “comfort” spot at some different point on the dial… and we also might set it differently for different things… maybe the ideal P/V ratio for your music is different from the ideal P/V ratio for your life partner. I think you are right about the P/V ratio, Vaneeesa. Is it a question of what you want from a second life? I come to SL to be me and do what i do in my first life, for example, observe. Or, I come to SL to see what I can become part of something that’s different. I suppose if you ”Engage” in an activity that has any degree of uncertainty, you will begin to create a separate identity. If you don’t engage then you remain with the realm of certainty as an observer; which is fine if that’s your preference. Hi Becky… I like this idea, “Two opposing needs that people have are the need for certainty and the seemingly contradictory need for uncertainty.” I think this is very much a part of what happens with VR identity. I never thought of it like that before, but I like the idea. When I came to SL I saw myself as Me, my human; I even had my RL photo in 1st Life tab. I was a tourist, a computer technologist exploring this platform. I wanted the certainty of representing myself as the real me accurately as I could. I even tried to make my avatar shape resemble the real me. But then I engaged. It was nothing more than a desire to be appropriately dressed as I hung out at the Zen Retreat. I bought a kimono and then new possibilities were awakened. I saw things I hadn’t imagined before. I had no idea where I was headed but this became far more interesting than any reason I had from coming to SL in the first place. I was swept away toward uncertainty, to put it into your framework. Oh yes, the naming system blunder is only compounded by whatever insanity goes on inside the Lab that prevents them from fixing the mistake. When I signed up to Second Life the second time around, they made me choose a predefined surname. I was insulted! In SL I am Ironyca Rae, and although it has a nice ring to it, my “actual” surname is Lee. So now I wonder what the purpose of that was… so I could go and find my missing family? I love the discussion that evolved from what you said! The P/V variation (love that term!) is something I’ve also thought of. It’s especially clear to me when I play together with my boyfriend (as he’s sitting next to me): I think he likes a lot more V than I (when I think of that, it makes me feel so boring, aargh!). For instance, I’ve always played female avatars. Somehow I don’t feel attracted to the idea of playing a male character. My boyfriend plays both male and female characters, depending on the game he plays. If a new expansion comes, he picks a character he thinks will be in a good spot game-wise and levels that one first (which could be any of the several he has), while I have a ‘main’ character that I want to play and do everything with first. TLDR: my playstyle is that of a boring, conservative grandma! Yes, yes and yes, Ravanel!! I love the direction you are heading with this. As you point out, the choice of your appearnce is very defining. In Second Life, I see people define themselves in their profile, “I’m just me” but then they have these hulking male bodies or gorgeous female bodies with perfect everything, or they are furries or robots or slimey slugs. No one is like that; that’s not “just” them. hehe. They obviously mean their personalities but I wonder. Can’t wait for next in series. “I’m just me” and then they are slimy slugs… gotta love the visuals!